The Special of The Day...From the Orange Moon Cafe: "Thanksliving" Part 13 Thanksgiving Day, 2018 "Two Trees"
"Thanksliving" Part 13 Thanksgiving Day, 2018 "Two Trees"
Part 13 - "Thanksgiving Day 2018- "Two Trees"
We decorated our Christmas tree early this year because of upcoming schedules, and well, because we wanted to! I write this sitting nearby the brightly lit, abundantly adorned work of the great artist of the season, namely, my wife Frances. She does Christmas trees and decorations like no one else, which leads to a story and much thanksgiving in my heart. "Remove not the ancient landmark, which thy fathers have set" (Proverbs 22:28). Many years ago before Frances and I met, she traveled during the holiday season to Savannah, Georgia. While there, she visited a beautiful old Southern home where she was most impressed by the Christmas tree. Beautifully adorned with traditional ornaments, the tree also bore mementos of the owner, an elderly lady who explained to Frances that her tree was much more than a decoration of the season. It was rather a chronicle and commemoration of her life. Through the years, the woman had made a point to save keepsakes of all types of experiences. The items became Christmas ornaments each year, leading to a tree full of memories and opportunities for gratitude and thanksgiving. Then and there, Frances determined she would do the same when she had a home and a family. She has done so, and now I sit before an altar of our family's memories, but far more, a sublime gallery that exhibits the history of our lives together. I see photographs of family and friends, some of faces, and some of events we shared together. I see baby shoes, and little hands made of construction paper, and even pacifiers. Tickets from many concerts, plays, games, and speeches hang from the limbs. I gaze upon wedding and graduation announcements, along with a miniature version of our eldest daughter's law degree, tokens of of our son's Marine Corps career, reminders of our youngest daughter's college days, and our daughter in law's invitation to her graduation from aeronautical school. Our grandchildren grace many limbs, of course, as do our beagles through the years. And yes, Charlie Brown and Snoopy are all over the tree. Friends find their place, from clothespin replicas Frances made many years ago, to ornaments they've given, to golf balls and even tennis balls from major tournaments like the U.S. Open, Wimbledon, and the Olympics given to us a friend who serves as a tennis referee. 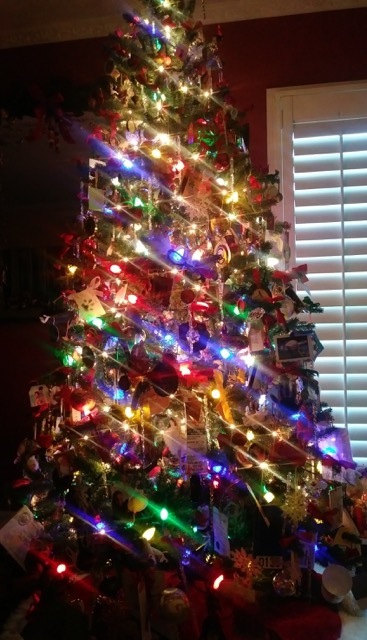 Of course, traditional lights and ornaments, carefully chosen, glimmer and shine from the branches. I could go on and on in describing what I see of the more than eight hundred items that adorn the tree. However, something far more important than visual beauty illuminates my eyes and especially my heart. "I will remember the years of the right hand of the most High" (Psalm 77:10). As Frances and I decorated our tree several nights ago, the occasion became a very emotional experience of thanksgiving for us. One after another, the aforementioned mementoes and so many others reminded us that God has so graciously and undeservedly blessed our lives with, as the carol so beautifully expresses, "wonders of His love." Opportunities for thanksgiving paraded before us in such beauty of remembrance that at times, we both literally wept. Even more, we praised the Lord and expressed our gratitude for so many moments, experiences, places, events, and most of all, people. Words finally failed, and we could only hope that our Heavenly Father would look into our hearts and see what He had wrought therein by blessing us with memories, and indeed, with far more than memories. A final thought. As we finished the tree, the thought occurred to me that all of those of those recollections, those opportunities for thanksgiving, had been purchased by blood, namely, the lifeblood of the Lord Jesus Christ whose sacrifice not only secured our salvation from sin, but also every "good gift and every perfect gift" bestowed upon us by our Heavenly Father (James 1:17). "He that spared not His own Son, but delivered Him up for us all, how shall we not with Him freely give us all things?" (Romans 8:32). Were it not for the cross of Calvary, God could not bless us in any way, measure, or form. Because of Calvary, and only because of Calvary, He can and will give and give and give again from the bounty of grace purchased by the suffering, sorrow, forsakenness, and death of His beloved Son and our beloved Savior. Every moment of time and eternity for believers comes to us as the gift of love made possible by the Lord Jesus. I thought about this as I gazed upon our tree, and as in my heart, I gazed upon another Tree. The former is so very beautiful. The latter was not. But it is, isn't it? Or rather, the One who died upon it is beautiful beyond all description. It will take forever to discover how beautiful, and even that won't be long enough. Mementos and memories brought such grace to our hearts, as they do now in the light of our tree, and far more, in the light of His tree. "Give unto the Lord the glory due unto His name. Worship the Lord in the beauty of holiness."